The great thing about a homemade or unfamiliar instrument is that no one can accuse you of playing it improperly. I have found that the playing of them breaks me of lazy habits developed over time on traditional instruments; and continually places me in a situation which requires, and sharpens, active-listening. Strange instruments are a discipline I impose on myself in order to broaden my pallette; a great growth-vehicle for the improvisor's ears. Fate has repeatedly brought me in contact with makers of such instruments, and players to whom their sounds were not unwelcome. I recently saw a newspiece on television about a fellow who can make a violin out of anything, and wished I'd caught his name. I enjoy traveling outside the confines of the culturally disintegrating US, and wherever I've gone, I've found strange and beautiful native instruments; themselves every bit as different (in sound and aspect from the 'Western' instruments with which most Americans are only familiar) as any of these 20th century homemades. Non-Western culture is, I find, pure and inspiring. In Korea, where I lived and translated for four years during the 80's, I quickly ascertained that shops catering to Buddhists were goldmines of neat percussion instruments. There, I obtained gongs, bells, bizarre wooden percussion instruments, etc. Friends who travel have brought back some wonderful things; the Taiwanese kweng (a harmonica of sorts), an electric saz from Turkey, a Vietnamese moon-lute (kai-dan-nguet), a Mexican quatro, and others. The Strum-Stick and the Can-jo are little known stringed anomalies of American origin. I keep my eyes peeled for forgotten American instruments, such as the fully functional circa-1925 banjo-ukelele I found for $60 last year, hanging despondently on a dusty display wall. My interest in 'foreign' sounds probably all traces back to the experiments with controlled- feedback I was doing between 1975-79 in my parents' basement. I wanted to determine the extent to which one could manipulate feedback in a live context. I made numerous flutes from American bamboo in the late 70's while an undergraduate in New York State's North Country. Our porch and property have a load of homemade windchimes, woodchimes, and other wind-triggered things that go "clank", "bonk", and "ding" scattered about; probably to the dismay of our neighbors on blustery days. I have been experimenting with self-made instruments ever since encountering the sonic-inventions of Hans Reichel, Fred Frith, and Eugene Chadbourne twenty years ago. In the trunk of my wife's car is the first Rake that Eugene Chadbourne built, given to me by Bob Jordan a few years back. The one, I believe, which was used on Shockabilly records. It still 'works'. When I discovered the music of Harry Partch, I felt I'd died and gone to Heaven. My microtonal composer friend, Dan Stearns, continues that tradition from his Cape Cod home. What follows are descriptions of the instruments I can remember making. Some, just didn't work out. Several, I cannot remember well enough to accurately describe. Cognitive deletion, y'know? JOE and THE HOWLER were the satisfactory end-products of quite a few failed attempts to simulate Asian stringed instruments. Others happened because spare parts suggested ideas worth experimenting with. As for common objects, if it sounds interesting, it's probably worth attaching a contact mic to. Ok.
...and then reattached the two halves with a big gate-hinge on the backside of the instrument. The frets were extracted from the neck. The Bend-guitar was a polyphonic, electronic percussion instrument; played using 'traditional' left-hand guitar technique [chordal-'fretting', bends/ hammer-on/off, sliding notes and chords, etc] and a combination of traditional and extended right-hand/arm techniques. Pressure [toward the hip, while pulling the neck back with the left hand] from the right forearm could be used to bend all strings simultaneously; generally adding the fun of a new, unexpected & radically dissonant detuning across the board. I'd seen Adrian Belew strangling his guitar and this instrument sprang from that observation. (Extended stretches of play, say...over 5 minutes, would reduce the tunings of all of the strings - however many remained - to "Bill Laswell-y" blubber.) Something went wrong once, while plugged into a Marshall stack during recording and it short-circuited, nearly taking my fingertips with it. Shades of Philip Lithman! Disassembled for parts in 1986. The tailpiece is now on THE ARC. [ http://www.homemademusic.com/artists/brethart/ ] In 1995, I gave it to Bob Jordan (notable, in the Aural-Innovations universe, for booking Architectural Metaphor into Gilrein's in Worcester). In preparation for the first Maximum Love Vibes 8-track sessions, this faux-reverb microphone was constructed. The rubber 'stopper' was extracted from an aluminum basebal bat, and a 1/2" hole drilled in the end of the handle. A Shure SM-57 was inserted, cord first, into the bat, and pulled down into the handle. We attached it to a mic-stand using clamps, and it was sung into...sounding cavernous and creepy, like a cartoon monster voice. The BAT-PHONE added a quavering reverb-like quality to vocals, and appears prominently on the MLV song Shutting The Door. It disappeared during a gig at the original Worcester Artist Group in 1991. The Howler is a 24" long, 1"x1" block of pine, with a cheesy flat plastic pickup I got for $2 in Korea fitted into a depression a few inches in from one end. In the center is a 2" high knife-edge bridge, and there is a tuner for its single low-E string, which is tuned to a high tension, though arbitrary, pitch. The line-out passes through an old MXR distortion pedal. It is played by plucking/striking the string to the right of the bridge, while applying pressure to the string on the other side, bending the pitch of the sounded note. This instrument is loosely based upon the Korean kaya-gum and Japanese koto. I still perform/record with it in the band AUTOMATIC MUSIC. Numerous strings pass through a Hagstrom 12-string tailpiece, extend over a 4" tall bridgepiece in the center of the instrument, and collectively terminate at a single Grover tuner at the opposite end. The body is two Chippendale chair legs, connected by bolts and wingnuts in the center, where they pass through the squared ends of the legs, which are adjacent to each other. The sculpted portions extend up in an arc with a length of about 33". A Fender humbucker is embedded in the body near the bridge. The Arc is an electronic percussion instrument, played with a mallet or stick. Very noisy and clamorous. You'll hear THE ARC on an upcoming AUTOMATIC MUSIC release. A large plastic salad bowl with contact mic. A gift to percussionist, Scotty Irving, when we were in the post-R.I.O. group - The Rockingham County Recyclers. Had a great, zero-sustain clunky sound, with timbral variants on its edges and sides. It was stolen when his station wagon was broken into. Lost a vintage Electro-Harmonix Space Drum that day, too. This is a Korean tae-gum; similar to the oboe, for which the bamboo reeds can no longer be obtained. As such, unplayable until a clarinet's mouthpiece was fitted onto it. The tae-gum has finger holes like a recorder, rather than keys. Sounds raucous, like a goose. 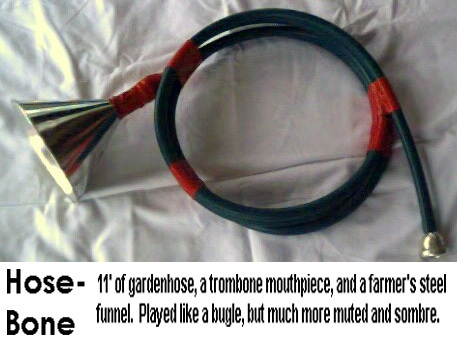 A length of garden hose fitted with a trombone mouthpiece on one end, and a funnel on the other. Capable of doing the same general things as a bugle, but far more silly sounding. A Kramer guitar neck attached to a 1950's Silvertone banjo body strung with three bass strings and amplified. Requires a very heavy plectrum. I use a compressor to beef-up the volume and add a wee bit of sustain. This gets played in our 'avant-Appalacian' (mutant Bluegrass) band, The Cat's Pants. This is a small, pink plastic cylindrical thing which I found attached to the underside of an antique child's rocking chair; which made a sound like tiny windchimes when the chair was rocked. I removed it and affixed a contact mic to one end. Held in the fingertips and moved in a circular motion, it produces huge bell sounds, which are controllable to some extent. Named after the composer for player-piano, Conlon Nancarrow. Used on the Alonzo Phillips record, FACED. A child's toy rainstick (clear plastic with tiny colored balls inside) with attached contact mic. Does not sound like your average rainstick, as the individual 'tick' sounds are comparatively gigantic. Used on FACED. A small ziplock bag containing a handful of little toy 'sleighbells' and a contact mic, wrapped in duct tape. Shaken, it sounds thunderous - sometimes like machinery. Also on FACED. CLICK HERE to return to the Bret Hart / InstrumenTales profile index page.